ANN ARBOR, Mich. — A trip to the pediatrician's office can be a nerve-wracking experience for both children and their parents, especially when efforts to calm young patients down dominate the visit. And half of parents of toddler and preschool-aged children can relate, saying their child is afraid of going to the doctor, according to a new report from C.S. Mott Children's Hospital National Poll on Children's Health at the University of Michigan. 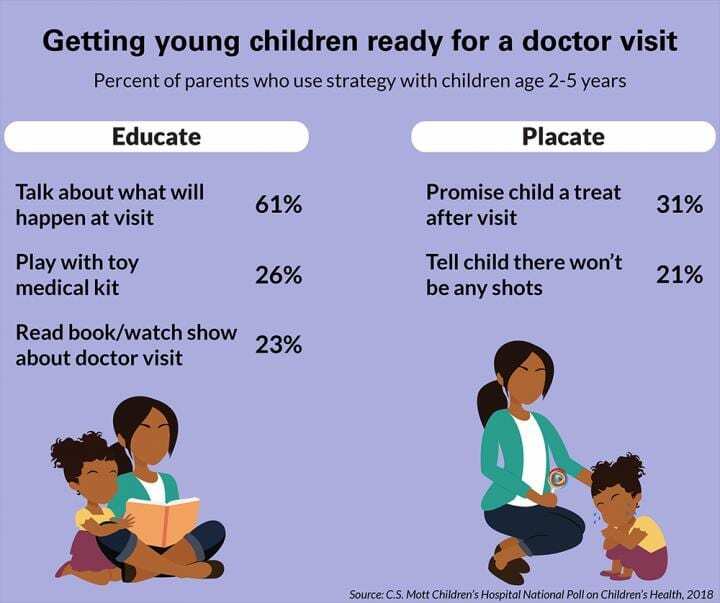 "Regular check-ups are vital during early childhood, not only because of important preventive services like vaccinations, but because they provide parents an opportunity to discuss health concerns with their pediatrician," says Mott Poll co-director Sarah Clark. Among parents with a child afraid of doctor's visits, fear of getting a shot (66 percent) and stranger anxiety (43 percent) were main reasons children age 2-3 years were afraid. Being scared of a shot was also the most common reason children ages 4-5 feared doctor visits (89 percent), followed by stranger anxiety (14 percent) and bad memories of being sick (13 percent). Children's distress also interfered with parents' ability to ask questions and share information with their provider. Twenty-two percent of parents say that it was hard to concentrate on what the doctor or nurse was saying, and 9 percent said they would sometimes not ask questions or bring up concerns, because their child was scared or upset during the visit. Four percent of parents reported delaying their child's vaccination, and 3 percent cancelled a visit all together because of a child's fear. "Parents say the biggest source of fear is 'needle phobia,' which can be especially tricky for younger children who require vaccinations more frequently," Clark says. "Children's fear of shots can be exacerbated when they pick up on their parents' anxiety and it can often be difficult to calm children down during these services." "Telling the child there will no shots at the visit when the child is due for a vaccination or saying 'it won't hurt' may backfire and only increase anxiety ahead of future visits," Clark says.